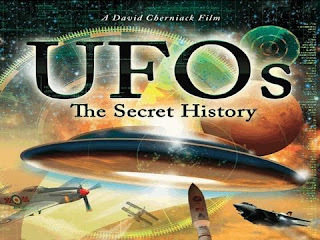 Another recommended UFO film to watch and this week's Weekend Video is UFOs: The Secret History. It has a fresh take on the UFO phenomenon and is highly informative. On June 24, 1947, a pilot and businessman named Kenneth Arnold spotted nine flying objects near Mount Rainier in Washington. Quickly reporting the sighting and coining the term "flying saucer", mankind's fascination with UFO and anything extraterrestrial started. It's not over the top or too heavy. The video traces the progression of how we view UFOs throughout the years. It has great footage and interviews that will entertain both novices and UFO enthusiasts alike. The documentary doesn't really highlight theories or conspiracies about UFOs and extraterrestrial aliens. It focuses more on the history of UFOs and how it reflects our culture. As stated by Jerome Clark, author of the award-winning, multi-volume UFO Encyclopedia. "UFOs: The Secret History is the thinking viewer's guide to the puzzles and paradoxes of an extraordinary phenomenon that continues to haunt our times and trouble our dreams. It is also gorgeously filmed - a feast to eye and mind, a thrilling experience on every level." About the film, David Cherniack , the filmaker, says, "The role of science has been severely lacking in addressing the question of extraterrestrial visitation,". Cherniack himself has witnessed a UFO event when he was a boy. In an interview he adds, "That really is the question I'd like people to come away from the film with — the role of science in this whole thing, in particular some scientists who have acted as debunkers, and unreasonably so.. It seemed like sometimes they were making things up as they went along no matter how ridiculous they sounded."